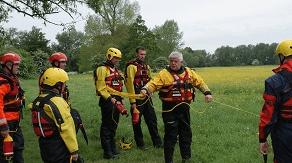 In keeping with the ALSAR Water Safety strategy, ALSAR held its first National Water Safety Training weekend over May 8th-9th in Oxford. An excellent response was received from units with 24 member’s attending across 14 units. 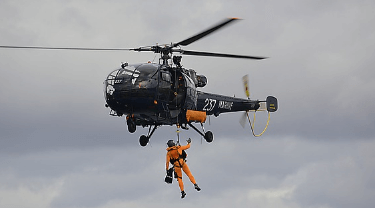 The weekend was split in two with the first day being a Train the Trainers Day for Water Bank Search Teams. This was delivered by Howie Crook of Re-Think Training. 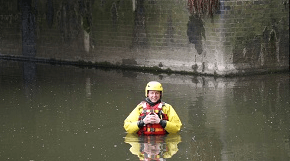 Howie has extensive experience in water rescue having trained outdoor technicians, Police, Fire, Paramedics, RNLI and mountain rescue teams from across Britain; he is also a qualified mountain instructor and kayak instructor/assessor with over 20 years of moving water experience. Howie also sits on mountain rescue’s advisory panel for water rescue. With the assistance of Paul Lewis MBE (ALSAR Training Officer) and Andy Ford – FRS (many thanks Andy for the excellent venue and the use of the local Fire station) who delivered an exemplar of how units should deliver water Bank Search to its members. The main purpose of the day was to introduce units to the National Standards and to demonstrate how to deliver a Water Bank Search course at local unit level. 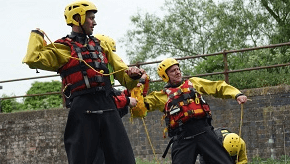 The Sunday the attendees took part in the First Module Module 2 – Water Rescue First Responder training with Andy Ford, Those who attended have now been added to ALSAR’s national register. 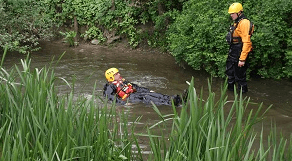 As soon as the training equipment has been procured it is the intention that these 1 day courses will be run frequently in order that units can form 4 person flood access teams, which they can declare as assets to their Local FRS, to be called on during times of flood. The main aim of the weekend was to raise the awareness of ALSAR’s strategy for both the Bank Search and Flood access and to set national standards and best practice for units to roll out to its members at low cost. It was great to see so many people from the different units sharing experience and working together.